Editor's note: Lani Hart is a co-Founder of Lord Nelson Yachts, Ltd. This web page is a word-for-word transcription of her letter which she wrote in December 2010. Lorenʼs love of the ocean stemmed from his early years as a member of the navy, and then later working in the merchant marines. The years following his time in the navy and the merchant marines, Loren began a career in teaching, but continued to sail along the California coast from San Francisco to Mexico, mainly during the summer months when he had breaks from teaching. Soon after he and I married, we spent seven (7) months sailing a 36ʼ Offshore Choy Lee sailboat from Florida thru the Panama Canal on to California. During this sojourn, we made a stop in Costa Rica. 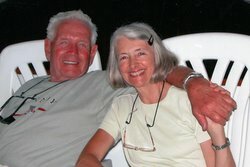 Here we met Jim Riley, who at that time was beginning to develop a sailboat design, that today is known as the Cabo Rico. While in Costa Rica, Loren and Jim discussed opportunities for venturing into business together. when Loren and I went back to California, he continued to toy with the idea of joining Jim in the boat business. But, soon realized the Cabo Rico product at the time was not evolved enough for him to quit his teaching job and wine distribution business. It was evident since we returned from the trip that he was becoming evermore dissatisfied with his teaching career, as well as his wine distribution endeavors. Loren truly longed to be around boats and the ocean, he just needed to figure out a viable business that would sustain us and provide him the opportunities he was looking for. As fate would have it, an advertisement appeared in boating industry magazine in the Fall of 1976, looking to acquire sailboat dealers for an upcoming line of sailboats. Because of this advertisement, Loren ended up traveling to Long Beach, CA to meet with the principal of Hans Christian Yachts. Shortly after this initial meeting in Long Beach, Loren negotiated becoming the Seattle Dealer for Hans Christian Yachts. At the end of the 1977 school year Loren resigned from teaching and we moved to Seattle. Once there we established ourselves on Lake Union, and became the northwest dealer for Hans Christian Yachts. While in Seattle and from 1977 to 1980, Loren sold more Hans Christian sailboats than the Hans Christian yards could produce. This overselling created a lull for Loren, and he became restless just waiting for sold boats to be delivered. During the lull, he would purchase other trawler type boats. Often needing to deliver a brokered vessel to Alaska. One particular boat, was a Grand Banks 49ʼ needing to be delivered from New York to Seattle. At first Loren had planned to hire a captain to bring the boat around, but then proceeded to deliver it to Seattle himself. Having sold me on the idea that the delivery would only take a few weeks. I was left behind in Seattle to maintain the business, all the while working full time at Seattle First National Bank. What proved challenging was that the few short weeks turned into months (August - December). I remember having to process two sailboats that had arrived in his absence. The reason it took four months to deliver the boat was due to weather and mechanical breakdowns. Pointedly, a storm caused Loren to challenge the Coast Guard, as he needed to enter Tillamook Bay after it was closed, in order to avoid staying at sea during a major storm that he knew the boat could not withstand. Our time spent in Seattle is when Loren began to notice discrepancies in the available boats on the market to the demands of boating customers. He developed a keen sense of market needs and discovered underdeveloped niches. The cruising trawler lines were just starting to emerge. By him delivering vessels other than sailboats, he became aware of an expanding market for these cruising trawlers and started paying attention to boat design and hull manufacturing. At the end of summer 1980, Loren made the leap from dealership to national distributor of Hans Christian Yachts, this facilitated us moving to Long Beach, CA. After the move to Long Beach, Loren found the partnership constricting to his newly developed opinions on market trends, and boat design. This caused the relationship in the partnership to become very contentious. Through his elevated position as national distributor, Loren had established a close working relationship with the yard owners in Taiwan. One particular yard owner, Fu Yi (Tommy) Chen mirrored Lorenʼs newly formed opinions with regard to the boating market and was independently developing a new hull design. Tommyʼs yard in Taiwan was known for superior workmanship and master woodworkers. Tommyʼs exceptional talent, knowledge of marine architecture and attention to detail, is embodied in all the boats he built. For this new design, Tommy needed a sales representative in order to create capital for actually building the design. While Loren liked Tommy and respected his building expertise, Loren knew the design would not sell as is. Together they formed an alliance and fine tuned the design into the 41ʼ sailboat, that launched Lord Nelson Yachts in 1981. Starting a new company Loren and I knew we needed a name that would give instant recognition with strong tradition of the sea to compete against Hans Christian. A tongue in cheek approach to finding a “loftier” name other than Christian, we decided Lord worked. In reality aligning the design to sea lore, was better personified by utilizing Lord Nelson, as the name harkened back to antiquity, thus tradition and would also give instant recognition. After campaigning the Hans Christian sailboats nationwide and building up their production Loren found that selling Lord Nelson sailboats was competing against himself. But with the same strategy of national promotion and campaigning in all boat shows coast to coast our niche was made in the market. Sensing the market needs in the trawler line, Loren wanted to add a powerboat but with more distinction and in keeping with tradition. Admiring the tugboat lines, a “pleasure tug” seemed to be a natural fit. Loren knew in his mind exactly what he wanted, but was not disciplined in naval architectural drawing. He would sketch out his ideas (albeit roughly) and then sought out Jim Backus to help develop a line of cruising tugs. My memory of this time is that things were a bit tortuous for both of them at first. With Loren trying to convey what he wanted and what Jim knew would actually work. Between Loren, Jim, and Tommy, the Victory Tug 37ʼ was born. 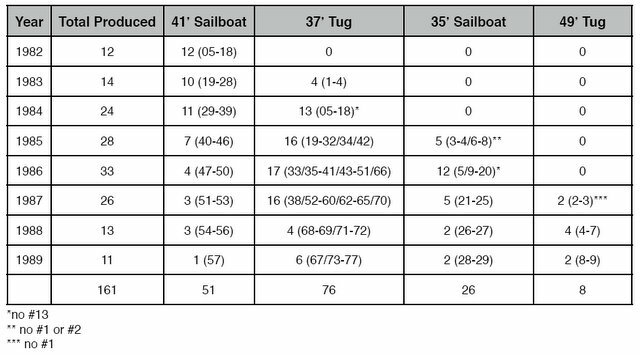 Thoughts about which market would primarily be best for the 37ʼ tug, it seemed the Northwest was the natural choice. However, the East Coast could not be discounted. To our surprise, the debut of the 37ʼ tug at the Miami Boat Show in 1983, was overwhelmingly embraced and accepted as a viable cruising vessel. At this one show, Loren sold three (3) unbuilt boats, and the one in the show. Interestingly, we found that women too, fell in love with the tug and were influential in spreading the word as they would bring their husbands over to the tug insisting they have look. This exposure and positive response at the Miami show, not only proved there was brisk interest in the tug, but also, that a smaller sized sailboat would be a top seller as well. Thereafter, he and Tommy Chen immediately developed the 35ʼ sailboat to round out that part of our market. Affordability coupled with quality was Lorenʼs mantra. The ultimate goal was to build the best possible boat and sell it at a reasonable price. Making money was not Lorenʼs true motivation, money was not what gave him satisfaction. Being known as Lord Nelson Yachts was fine in terms of the sailboat line. With the inclusion of the tugs, the name Lord Nelson Yachts really did not signify accurately our intent for the tug in the marketplace. Therefore we decided to name the line of the tugs “Victory,” after the flagship of Lord Nelson. Much credit to the success of the designs for the sailboats and tugs is due to Loren insisting on certain features; traditional lines, heavy weather capabilities, luxury with old world feel, etc. Loren always wanted the boats to be of a quality so that the boats could be used beyond coastal cruising. He was determined to have the boats live up to their namesake and wanted them to be truly seaworthy vessels. Some design features he sought have been borne out as new standards in the industry. Those most recognizable are removable water & fuel tanks, solid wood interior, heavy/thick safety glass for all windows, dutch doors, single rudder (for protection), separate head and shower, high bulwarks for safety. To elaborate on this, I recently received a letter (August 2009) from Jim Backus, that succinctly sums up how and why those items listed were included in the design of the tugs. 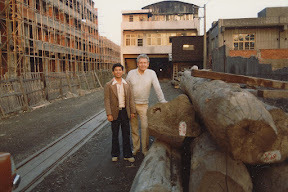 Tommy Chen, who built all the LNVTs, and Loren Hart in Taiwan with teak logs. Lorenʼs idea of a tug, keeping with a traditional form was a new approach. While the Sundowner and Nordic Tugs existed before the Victory Tugs, both were based on Northwest salmon fishing boat lines that were out of character as was the semi and full planing capabilities built into the Nordic Tugs. I still find it odd that the Nordic Tug planes and doing so, ruins its purported purpose. The same holds true for the American Tug. The Victory Tug looks like a tug because Loren saw a niche for a foreshortened but accurate tug. There was a considerable amount of discussion to keeping the appearance as true as possible within the constraints of its length. Originally we tried for a 36ʼ but it just wasnʼt possible, so it grew an additional foot. Another feature of the design is slight roll created by the turn in the bilge. The tug has a soft turn to the bilge and as such she does roll slightly, but Loren wanted the design to cruise for good distances and we were concerned with a snap roll as it would have an effect on the helmsman due to the height above the DWL of the helm station. I have heard some people didnʼt like the roll, but after hours at the wheel of a snap roll, hard chine boat, I think they would change their minds. A significant contribution to boating was the inclusion of the freeing ports, port and starboard. Due to the design of the deck part, with the deck totally pooped, the water contained within the deck weighted almost 14,000 pounds! Loren understood the problem this could cause when using American Boat and Yacht Council standards of the time; only 1.5 inch diameter scuppers were required. However with such a small combined opening, clearing the deck would take would take too long. The Society of Naval Architects and Marine Engineers (SNAME) standards were used and after several consultations and discussions with its engineers we went with freeing ports as built. (The SNAME standards are for vessels over 200 feet so the formulas did not translate well to the 37ʼ thus requiring the discussions.) At the time, I knew of no other small craft that used freeing ports as the main method of off loading water from the deck. Loren wanted a boat that would track well and also have the propeller protected. Lindsay Lord, a naval architect in the 1940ʼs had done a significant amount of work on keel design for planing boats and using his information and calculations the keel was sized and located as a function above of the above design waterline profile using the profile center of effort (as in sailboat sail plan) to balance the keel. This was important as the pilothouse structure sits forward and is high and large so it would have a major effect on the center of side pressures. While a great esthetic factor on the design, the split pilothouse door provided safety while allowing the pilothouse to be ventilated. Split doors have been used on large coastal tugs but it was an innovation when done on the Victory 37ʼ. One factor most people are unaware of is how well built the Victory Tugs were built. American Boat and Yacht Council (ABYC) standards were used for all nonstructural aspects while Society of Naval Architects and Marine Engineer (SNAME) standards were used for structural calculations. Where the results was oversized (as the standards then did not have a recreational boat stand alone standard) Scottʼs original text on Fiberglass design was used as was Marine Design Manual for Fiberglass Reinforced Plastics by Gibbs and Cox, Inc. If anything, the Victory tugs thus far exceeded standard minimum factors for safety. For the windshield, automotive glass standards were used to specify the thickness needed for green water service. Perhaps one of the greatest results of the concept and building process (of Victory Tug) is the realization of a yacht that has increased in value over time; a rare occurrence today. To add to the above; Tommieʼs innovative design of the hidden (swinging) engine room door with storage was also a significant addition to boat building of the day. After several 37ʼ tugs were built, work immediately began on plans for the 49ʼ tug. This proved even more challenging as in order to build a larger hull (49ʼ) Tommy needed to purchase additional land to accommodate the shear size of the hull. Tommy was currently building four (4) boats a month, and was maxed out. The land he purchased was on top of a mountain, and created the biggest challenge yet, as transporting the 49ʼ from the new yard to shipping was increasingly difficult. The roads to the shipping yards were narrow, and power lines needed lifting to accommodate the height of the hull when transported on the trucks. Tommy, resolved these issues but this squelched our idea for ever creating an even larger sized tug (i.e. a 59ʼ or 62ʼ). Market trends valued a boat that could plane, especially one the size of the 49ʼ tug. The original design of the 49ʼ tug was for it to plane. In order for the 49ʼ tug to keep its traditional lines, and still have a large engine room, the keel was added, thus not being able to plane. When twin engines were installed, there was almost 5ʼ head room left for walking full length in the bilge between engine beds. To keep costs down only one 49ʼ tug (hull #6), was delivered with twin engines, as at the time the trend was for large single engines. Much to Lorenʼs dismay. Loren always liked the safety of having twin engines. Later hull #9 (Momma Mia) was later modified with twin engines. Also in the works was a drawing for a 44ʼ tug (picture of layout, only). Loren and I dreamed of eventually building something in the 59ʼ-62ʼ range. None of which came to fruition. With the demise of Lorenʼs son (end of 1986), Loren slowly started losing interest in propelling the boat business forward. At this point all he really wanted to do was go be on his boat. We purchased hull #6 personally, in July of 1988. Spending the next 16 years cruising aboard. Our official phase out of the boat business happened at the end of 1988. With four (4) pre-sold boats, complete with issued Letters of Credit, and a flooring line secured for the successor, Loren ended his career in the boat business. Loren was the driving force behind Lord Nelson Yachts; and Tommy's Taiwan company Ocean Eagle Yacht Building Corp. Tommy's relationship with Loren was instrumental in the success of his career as well, therefore Lorenʼs bowing out of the boat business lead to the demise of Tommyʼs Taiwan corporation as well.